Sandy's Watercolor Classes are fun, lighthearted and enriching, whether doing 6 Step Sketching, working wet-into-wet on traditional cotton rag or on nonabsorbant, synthetic Yupo paper. Classes are offered at her Tabernacle, NJ based studio, at *your location and online and are geared to the individual needs and interests of students. We'll be working with a limited palette, so you'll only need 3 colors! I have created a Blick U Course Supply List for Basic Watercolor and 6 Step Sketching. It's an easy way to collect all the supplies you need, in one, convenient place. Students - always click on the link below to get to my class list. 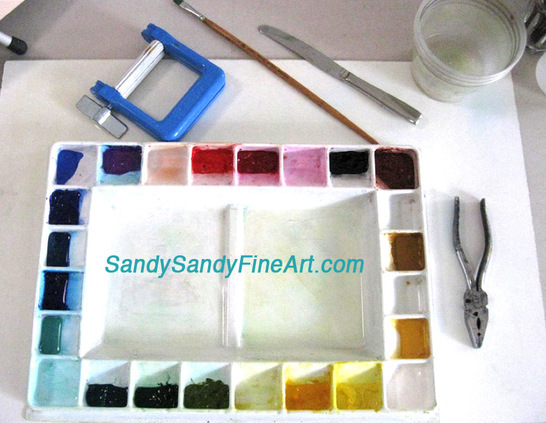 The supplies shown below are my current choice for a larger palette. This photo was taken after a thorough cleaning and a total palette makeover. Follow the link to see this process. Pictured is a paint tube wringer, bristle brush, butter knife, water and pliers (to pry off caps and squeeze the last splotch of paint from tube). You will also need plenty of paper towels, water and a spray bottle. * Colors most used - Usually DaVinci, Blick or Utrecht - Click the link below to order from Blick Art Materials online. My large palette is a covered Robert E. Wood. When not painting for a couple of days, I uncover, spritz the paint with water, let it breathe for a while, respritz then recover. My color choices have changed recently due to working on Yupo paper. I am now using more pigments with white in them as they seem to bind to the synthetic paper better. I prefer DaVinci and Blick brand tube watercolors for their consistency, quality and price but I have also used Windsor and Newton, American Journey and Lukas. 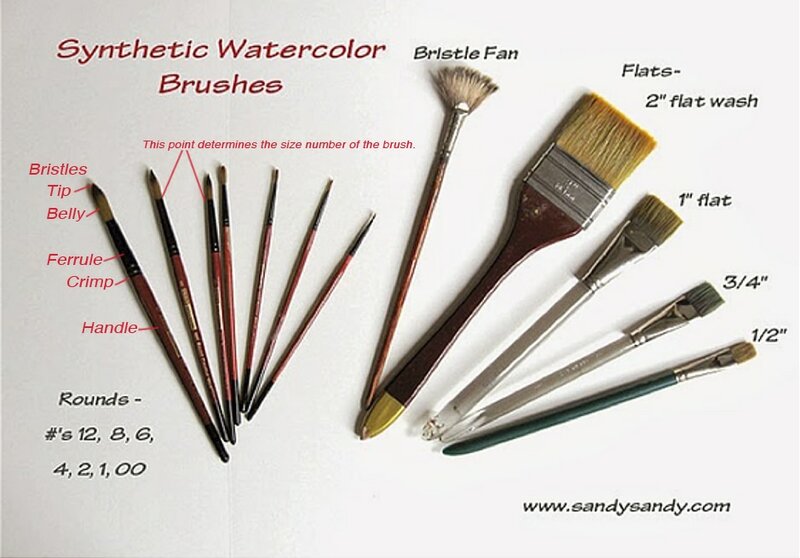 See Sandy's small watercolor palette here.